T3 Vehicle Security System guards your vehicle 24/7 even if you are thousands of miles away. T3 can save lives, help prevent accidents, and stop thieves! If you want to know where your vehicle is at any time, just send T3 a text message and T3 will respond with GPS location that you can view on Google Map™ with your smartphone. Smartphone Apps -- Check T3 Tech-Tips for easy to install Apps that let you ask T3 to do any of its functions with a couple taps. “Kill switch” --T3 lets you send a secure text to enable/disable the vehicle starter, which prevents the thief from restarting the car when the thief turns off your vehicle. Unlock driver's door -- T3 can let you unlock the car door using a secure text. T3 provides an output that may be used for door unlock, door lock, flash headlights, sound horn, etc. Usually you would have the installer do the driver’s door unlock. Login to MyTracker to register your T3 and choose a 911Tracker Service Plan. No contracts or cancellation fees. See service Plans for low monthly or annual rates. 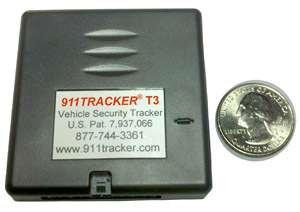 911TRACKER, Inc provides a 30-day money back guarantee on all 911Tracker products. See Warranty Information for coverage of your Tracker for one year from the date of purchase. Hugh in Salinas, CA says "I have a lot of emergency and radio equipment in my vehicle again the 911Tracker gives me the confidence that if my vehicle is stolen I will be able to retrieve all the equipment quickly without having any damage done to it."